What seems like an easy mission of finding trees in Merritt BC Canada to hang our Pouch Couch Hammock on seemingly, unwittingly turns into a 4x4ing adventure with plenty of mishaps, tricks and laughs. Never before did such a simple task turn into an all out “prankfest” filled with many good life-long memories, tumbles and “whats up” moments. Best part about it, we got it all on video. Whenever we can, we like to invite people to participate on our videos. Why you ask? Well, because it brings a new personality into the mix which is always interesting. On this hammock adventure we invited the host of the Moon Shadows Campground, Melvina White, to take part in some tree hunting. and gear testing. Little did we know, she had other ideas. Moon Shadows RV Park and Campground is not like any other privately owned campground in Merritt BC. In fact, the campground is very different than many of the privately owned campgrounds in BC. How? The campground does not pack in campers like sardines. This Merritt BC Canada campground, in many ways, is closer to being like our forested provincial campground parks – treed, room to move and places to explore. Moon Shadows RV Park and Campground provides 25 fully serviced RV spots, 25 non-serviced RV spots and 19 tenting spots and it is open year round. “The fully serviced campsites have electrical, wireless internet capabilities (two park networks and a Shaw hotspot), and water & sewage hookups with sewage disposal facilities. All campsites have picnic tables. Choose from: 20, 30 and 50 amp power, plus plenty of pull-through sites.” text provided by Moon Shadows Campground. To compliment your camping experience there are laundry facilities, hot showers, bathrooms, a sani station and a campground store. After golf cart 4x4ing and checking out every nook-and-cranny of the backcountry of this campground we settled back at where we started. Who would of figured? Yup, the two trees we decided on were not far from the store or the spot we were camping in. Once we decided on our hammock location we embarked on the fun and games of setting it up (please refer to video above). Unbeknownst to me I would become the brunt of the pranks all in the name of tourism and travel. Not a problem for me. I like to have fun when I can and when the moment suits it, as being serious all the time, is not attractive to me at all. There are many moments when being serious is necessary, but not 24/7. In my mind, making tourism fun is something we need to do a little bit more in our industry. Sometimes, the decision makers in tourism lose sight of fun. This is puzzling as happy is the very emotion tourism is based on. The day tourism loses its fun factor is the day tourism drowns in a sea of politics and ego. Follow us on our website and social media for daily updates and some ehCanadaTravel.com highlights. 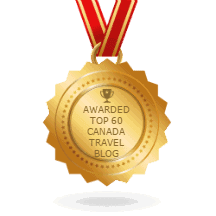 This is the eh Canada Adventure Travel Blog.